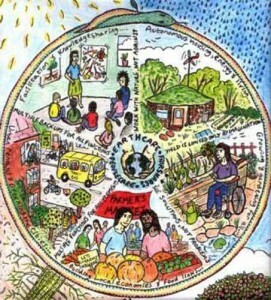 You may remember our wonderful “Change the World Wednesday” challenge this week, was to start to explore permaculture. Small footprints asked us simply to observe nature, close to home. My biggest epiphany, and I love how our hugest ‘Aha!’ moments are the simplest of truths, was that I feel GOOD by making the effort to be outside. I’ve been exceptionally busy recently and had a bought of anxiety and depression; when that faithful black dog is by my side I tend to do the things that are worst for me – not least staying indoors. I think I feel safe there, but this week taught me that it’s ok to be outside too! Unfortunately the weather hasn’t been great, so I have to admit it’s been a conscious effort to make myself go outside, but I’ve done it and I’m thrilled that I have. My other realisation was that I don’t really know what permaculture is; not really. I’ve tried to understand it, logically, but I guess getting out there with child-like wonder was the way to find out. The first thing I’ve noticed is the way I grow food. I have followed my Dad’s idea and all the post-war gardening programmes and books, that you plant neat rows of food, which makes it easier to weed. By looking at what is going on out there, nature doesn’t work like that! There aren’t ordered, neat rows or bare soil where weeds have been pulled up. Every possible inch of space is filled with life. I understand I need to give my crops room to grow, so I Need to pull up the weeds but we don’t need to wage war against them; after all a weed is only a plant in the wrong place. This week I did some weeding and gave them to the chickens to peck over – they were delighted and in return I was given beautiful brown eggs; that has to be permaculture at its best. I let the chickens forage on a piece of land; they picked out the weed seeds, I ended up with clear land, they had full bellies and they gifted me eggs. If gardening continues like that I’ll be very happy! Dandelions are fed to the bunny but are good for humans too if you like the bitter taste. I realised that I’m planting food yet there is so much food in abundance already growing; nettles, wild garlic, cleavers … and then there are herbs I’ve planted that I couldn’t get rid of if I tried; I guess they are native right? mint, lemon balm and marjoram die back every year and yet now, mid May, they are bursting into life again. I even found tiny sprigs of lavender, which I’ve been led to believe is virtually impossible to grow from seed; which had planted itself. At the front of the house I saw how some plants were taking over – all planted by humans of course The lilac tree has spread from one end of the garden to the other, wallflowers are growing through the concrete drive and breaking it up, while soapwort has grown under concrete paths and is pushing up into three beds. This is only scratching the surface; we were asked to notice the insects and birds, phases of the moon and how water collects on our property, so there is so much more to explore. How about you; how did you get on with observing permaculture at play this week? Isn’t it a revelation when we, all of a sudden, realize that there are more ways to do things other than the methods we were raised with. It’s looking at the world with new eyes and seeing opportunities we didn’t know existed. I don’t know if you have had a chance to read Kim’s post on the challenge (http://ourdailygreenlife.blogspot.com/2012/05/permaculture-green.html). I find it so fascinating because it moves us from a farming mentality to a foraging mindset. It seems to strive towards a sustainable garden which basically grows on it’s own and more as nature intended. Lucky you that so many herbs are growing on their own. Your yard is like a culinary “one-stop-shop”. And I can just imagine your happy little chickens getting weeds for dinner. I just started to learn about this and I find it so interesting! Your posts are always so informative and I love reading them! Thanks for sharing! This is a great example. It feels so good when you see something go full circle like that, no waste of any kind. I am trying something [sort of] similar with my loose leaf tea. Instead of throwing away my brewed leaves I use them to feed my tropical plants and herbs.